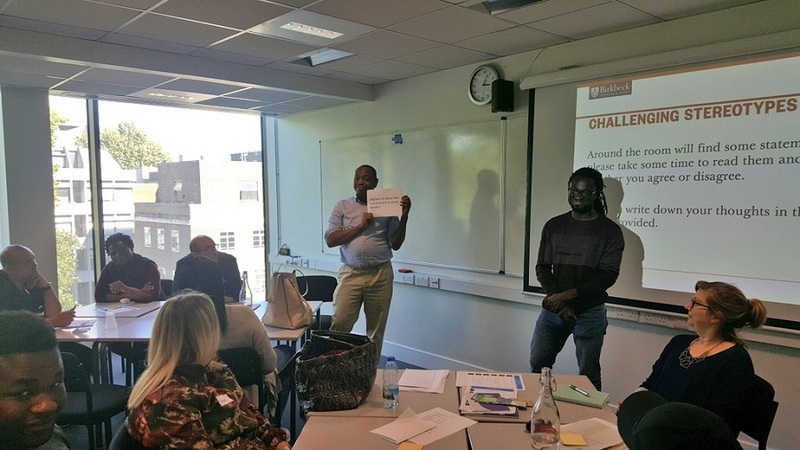 Birkbeck counsellors, Jo Myddleton and Aura Rico and counselling students Michael Darko and Ishiabah Kasonga write about the collaborative approach they took when tailoring a well-being workshop for the needs of forced migrants, who were starting their academic journey at the College, through the Compass Project. The Compass Project has welcomed its second cohort of students to study a university level qualification at Birkbeck, providing 17 fully funded places for those who have sought sanctuary in the UK. The project is unique within the sector, due to its focus on supporting mature forced migrants who may have missed out on accessing education and have faced difficulties in accessing educational opportunities owing to strict entry requirements and a lack of documentation to demonstrate academic ability. This year, to support students in the start of their journey, the Access and Engagement department organised a two-day orientation, offering a space for students to get to know one another as well as raise awareness of the range of support available at Birkbeck and an introduction to the colleagues behind this. Starting university can be an overwhelming experience for any student and with that in mind, running a session on mental health and well-being was a key topic to explore as part of the orientation. It was also important that we recognised that those from a forced migrant background are likely to present challenges that differ from the average student population. To ensure that the workshop on mental health was meaningful and in line with the needs of the students, the Counselling Service at Birkbeck partnered with two current students studying Counselling and Counselling Skills, and who had started their journey at Birkbeck through the Compass Project in 2017 – to ensure that the experiences and feelings of forced migrants were understood and addressed during the workshop. “When the Counselling Service was invited by the Compass Project to deliver a workshop on Culture Shock and Adjusting to University Life, we very much welcomed the opportunity to meet the new students and support them at the start of their journey through their courses at Birkbeck. “We have been delivering these workshops for some time so the material was pretty much ready and we just needed to practise a bit and manage our public-speaking nerves. A few weeks before the event, however, Naureen got in touch: two of the current Compass Project students who are studying Counselling and Counselling Skills were keen to be involved in designing and delivering the workshop, to ensure that it particularly took into account the needs of those who have sought asylum. “Looking back on it, we remember receiving this request with certain ambivalence: We know what we are doing and the workshop is ready to go, we thought. However, we also recognised that Michael and Kasonga would be particularly well-placed to add valuable insight for the benefit of the new intake of Compass Project students. We got on immediately with Michael and Kasonga: they were full of ideas and very perceptive about the specific challenges that Compass Project Students face. We found the meeting enlightening. “I was in high spirits and full of excitement from passing my first year on the counselling course. Having navigated many ups and downs through my first year back at university. I was pleased to see an email from Naureen asking if any of us would like to be part of this workshop. “I thought this was an excellent idea, so I jumped on board straight away. The chance of working alongside the counselling team at Birkbeck was very appealing but most importantly I felt that both the Counselling Service at Birkbeck and the College was genuinely interested in the value students could bring. “I am a strong advocate for bolstering the voices of those who have gained insight and expertise through their experiences, so the decision to include students in this process showed me the level of commitment Birkbeck has to students’ well-being. “I remember having a meeting with Kasonga and thinking to ourselves, ‘why do they want us to be involved?’ I mean the Counselling Service are the experts in this field and surely, they must have all the answers so why do they need us? “Our first meeting with Aura proved to us just how much the Counselling Service here at Birkbeck is committed to student well-being. It became very clear that this was not about how good the Counselling Service is, rather, it was a genuine effort to better understand the needs of students and to become better equipped to support them. “This was all about the students; we both felt valued, which gave us the confidence to open up and talk about our experiences as first-year students on the Compass Project, the challenges we faced and how we overcame those challenges. “The Counselling Service team were very welcoming of our ideas and insight; the way both Aura and Jo designed the workshop was magnificent in the way that Kasonga and I could bring in our own experience as students within the compass project. Kasonga and I found it very easy and a real privilege to work with Aura and Jo. “The workshop was structured brilliantly, the group discussions in which experiences, feelings, assumptions and attitudes were shared and explored worked well and I felt that everyone was engaged. The whole experience made me feel that I was in the best learning institution I could ever be and part of something. “Thanks to this collaboration I feel there is a better understanding of the complex needs of the Compass Project students and the challenges that they face. I am confident that counselling and other available services here at Birkbeck are better equipped to support these students, and I hope that should they need to students will feel able to engage with the many different sources of support available at Birkbeck. The Counselling Services at Birkbeck is committed to improving the wellbeing and mental health of all Birkbeck students. They offer free, confidential, non-judgemental counselling to students – to support with their engagement and experience as a student at Birkbeck. This post was contributed by Éimear Doherty, a student on Birkbeck’s MA Arts and Policy Management. ‘The Acts Between is performance piece which aims to explore the themes of mental health and the passing of time’. This left me a little confused. Unsure as to whether I was attending a performance or an installation; whether I was going to be a member of an audience or a viewer, I arrived at 18.00 (so as not to miss any important introductory explanations). With no information provided about the artists involved, I decided to be embrace the mystery of it and not research Between the Acts (the final novel by Virginia Woolf, published in 1941 shortly after her suicide), as I would have normally been inclined. In hindsight, this might have been a sensible thing to do, however I am of the opinion that one should be able to attend a performance or exhibition without extensive preparation and still be able to participate. Due to this unfamiliarity with the referenced novel, I entered G10 curious, with a kind of nervous excitement, which lent itself to the experience. Feeling as though I had stepped into the mind of an over active imagination, I did not know where to start first. Kevin Barry describes how he flits and hops from book to book, in the same way we flit and hop from site to site. I wish I did not identify with this behaviour, the curse of modern society and technology, but I know I am not alone. At first, my impatient mind was quite satisfied by the overlapping of Sinéad O’Connor’s ‘Nothing Compares 2 U’ and Britney Spears’ ‘Circus’. The problem with this amalgamation, alongside a loop featuring the sound of a crying baby and the infamous internet dial-up tone, is that I did not recognise the fire-alarm and thought the noise to be part of the show. On return, I was ready to do some reading and found some Silvia Plath handwritten on dark rice paper, before moving on to a table filled with pamphlets on Bi-Polar disorder. Then I flitted off to a small table covered in diamonds and aspirin and listened to Marilyn Monroe sing ‘Diamonds are a Girl’s Best Friend’… this was complemented by a nearby overturned chair, surrounded by bottled liquor, make-up and hairspray. Curious, but it wasn’t long before I was hopping in and out between the shoe-strings, which presented punched photocopies of texts, checking out the small pebbles and bagged popcorn along the way. For me, the most intriguing aspect of the installation was the black and white video being played on the screen, left of the entrance. I did not watch it at first, too engrossed by the flickering pink projection been screened on the central wall. However, it was this monotone video that maintained my attention above the other stimuli. The viewer was invited into no.43 and guided up and down the building’s labyrinth of corridors and stairs. What made this video eerie was the fact that the performers were outside room G10 throughout the performance/installation, so even exiting The Acts Between had a sense of the surreal to it. The video eventually leads us into The Acts Between installation, so that we are left watching a view of the very room we are starting in. Up until that moment I felt unsure about the space as a whole but I think this moment brought it together for me. The idea of recording. Of never really being ‘present’, too distracted and concerned about experiencing moments behind a piece of technology. I am not going to pretend that I now (or ever did) know how this all links to Virginia Woolf, her work and life in Bloomsbury. However, I will say that it made me consider even more carefully the veils through which we view our daily lives and what we use to alter our impression, and people’s impression of us. Time did move quite quickly while in The Acts Between, feeling as though someone had pressed fast-forward. Perhaps the idea was to create an environment where guests had the opportunity to gain a sense of what living with anxiety can feel like. Or perhaps this visitor did not read between the acts, objects, space and lines in way the artist’ had envisaged one to.